Open water swimming is a truly different experience to the pool, and one all swimmers should try at least once! Without the confines of lane ropes or walls, it’s liberating, adventurous and unique. Open water also appeals to the adrenalin-seekers. Competitive races are often frenetic and fierce, with swimmers hustling and bustling for position. Intrigued? Read on to find out more about open water swimming. 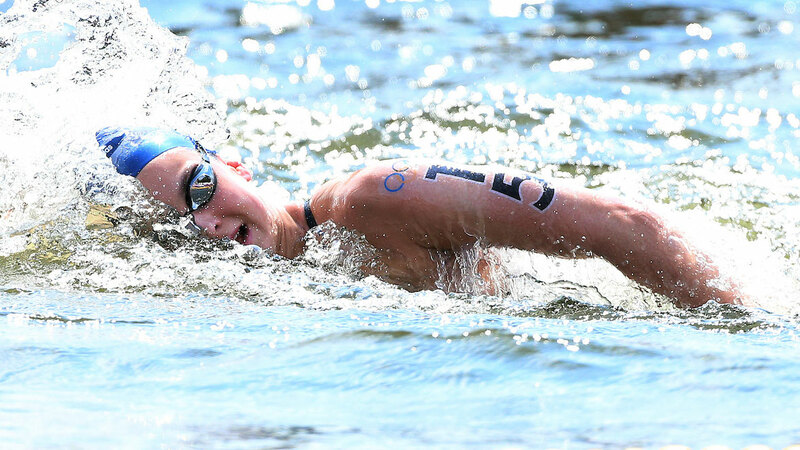 So, what exactly is open water swimming? A fair question! Technically speaking, open water swimming takes place anywhere that isn’t a swimming pool. This means no man-made sides and bottom, and no lane ropes or black lines to follow. Most people find the freedom and lack of chemicals so invigorating they can’t help coming out of the water feeling happy and relaxed. However, you do have to consider there are plants, fish and other things living in the water which add to the fun! You might also see open water swimming referred to as wild swimming or outdoor swimming. The names are very interchangeable but to make things easy we stick to the term open water swimming. Wild swimming also means swimming in groups or individually where there is no supervision. This is a riskier choice for swimmers, and we recommend you never go open water swimming on your own. Swim England has a long association with open water swimming and has run a national open water championship for more than 100 years. Competitive swimming at the Olympics traces its roots to competitions in the sea, lakes and rivers rather than pools, although modern open water swimming races tend to be held over longer distances than are swum in the pool. The sport has increased in popularity since men’s and women’s 10km Marathon races were included in the 2008 Olympic Games in Beijing 2008. English swimmers Keri-anne Payne and Cassandra Patten won silver and bronze respectively for Team GB in Beijing. The 10km Marathon was one of the most popular events at the London 2012 Olympics, with hundreds turning out to support Payne in the open water swimming race held in the Serpentine in Hyde Park. Open water swimming is for everyone of all abilities and age groups as long as you have the ability and confidence to swim without being able to put your feet down. Remember it’s very likely you’ll be out of your depth for some of the time (if not most of the time). You can take it as seriously or as casually as you want to, from social swimming to elite level. All we ask is that you try and enjoy what you do.